Druk Air, Royal Bhutan Airline, has facilitated direct flights between Singapore and Bhutan since 1 September 2012. 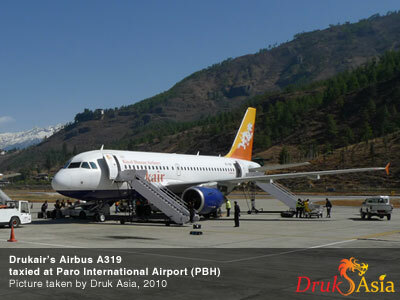 Druk Air has signed memorandum with Changi Airport to start direct flights between Singapore and Bhutan on 17th May 2012. Druk Air currently flies from Singapore twice a week. Flights from Singapore to Bhutan are expected to take 5 hours with a 45-minute refuelling stopover in Kolkata. The flight will typically depart Changi Airport around 6 am in the morning. Druk Asia as the official ticketing agent of Druk Air, Royal Bhutan Airlines, will be working with industry partners, such as major hotel chains and bespoke travel agencies to offer unbeatable travel packages and tours to Bhutan. Keep up with our webpage to read the latest updates on the Singapore - Bhutan route. The new Paro (PBH) - Singapore (SIN) route is serviced by the Airbus A319 in a 114-seat configuration comprising of 20 business class seats and 94 economy class seats. The entire flight is expected to be only about 5 hours, saving travelers from the region up to 12 hours. In the mean time, Bangkok is still the most convenient port of entry to Bhutan. Druk Air departs daily from Bangkok into Bhutan.